I grew up on a dairy farm, so if you would have told me I’d one day book a vacation to sleep in a big red barn, I’d have thought you were crazy. 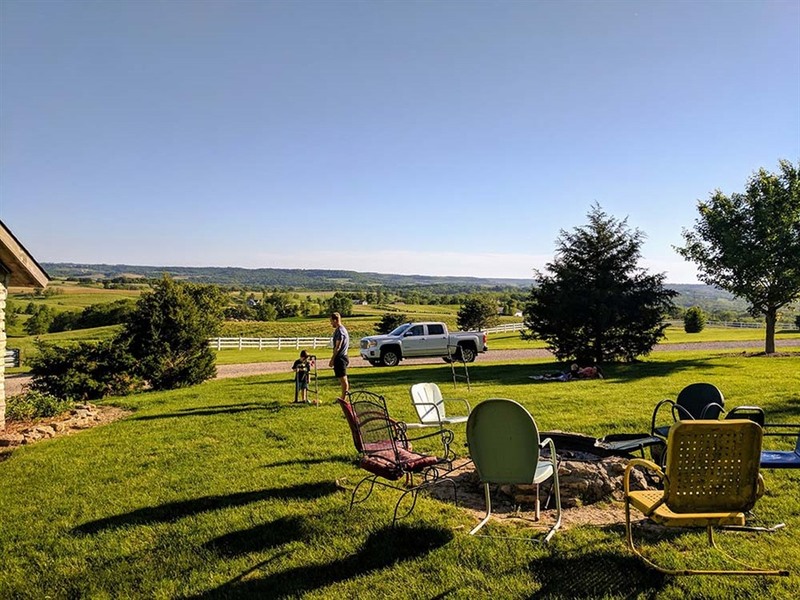 But that’s exactly what a group of friends and I did in May – and we had an absolute blast at Elkader’s cute and cozy Barn on the Bluff B&B. Perhaps the coolest part of the B&B was exploring the bedrooms! The 110-year-old converted barn sleeps up to 28 people – and there are a variety of sleeping arrangements. From single bedrooms to sleeping lofts (the kids were so excited to climb a ladder to sleep every night! ), there was plenty of room for our comparatively small group of 12 to spread out. A big part of the “B&B” is breakfast – and wow, this did not disappoint. The owners plan each day’s breakfast menu especially for each group that stays and then roll it out to the barn on a cart. We devoured stuffed French toast, locally-raised bacon and pork, eggs with fresh goat cheese and herbs, and the kids got chocolate chip pancakes made-to-order. As if the barn isn’t fun enough to explore, the view outside will take your breath away. Located on the River Bluffs Scenic Byway, it looks out over incredible rolling pastures and farmland. A herd of beef cows located on the farm completes the picture. Barn on the Bluff is that perfect mix of cabin, hotel and B&B – and it features the best of all of these. Outside, the fire pit (wood is supplied), a huge patio, and grills will make you feel like you’re camping. Step into the basement of the barn to take advantage of the game rooms and pool table. Head up the stairs and you’ll be in a full kitchen and steps away from a huge, yet cozy living room and dining area. And although you don’t need to leave the barn to have a great time, it’s located just three miles from the beautiful town of Elkader and about 45 minutes from Pikes Peak State Park, Effigy Mounds National Monument, and the river town of Guttenberg. The owners have thought of everything to keep visitors both entertained and safe – from the supply of board games and books to motion lights on the stairs at night. Our group is still talking about our “happy place,” Barn on the Bluff. Book your own stay by calling 563.245.2820 or emailing bontheb@alpinecom.net. Wow! This sounds absolutely fantastic! Thanks for the post.